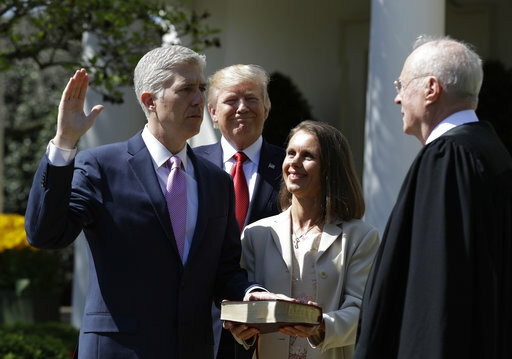 (CN) – Justice Neil Gorsuch thanked his former law clerks, family and friends on Monday as he was sworn into the Supreme Court during a White House ceremony. The new justice joined President Donald Trump, all of his fellow Justices, various Senators and his family for a Rose Garden ceremony. Gorsuch thanked his family for their “perseverance and patience” and his mentor, Justice Anthony Kennedy, for whom he served as a law clerk. The ceremony, Gorsuch’s second swearing in of the day, made history as Justice Kennedy is the first sitting justice to swear in one of his former clerks to serve alongside him on the court.